Myriad lines surround our day-to-day lives, exiting and entering our homes. Wires connect to electricity posts which power and heat our dwellings. Cables hook us to telephone and internet networks. Other lines stretch the world closer to us and our homes closer to the world: paved driveways link us with roads and highways, mains tap us into common water reserves and flow into municipal sewers, satellite beams reach into the atmosphere to download television signals into our living rooms. Together these lines constitute extensive and powerful webs through which our lives are suspended. 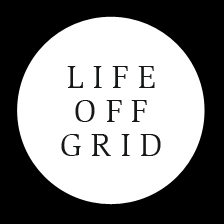 These are the “grids” upon which society is pegged, the grids through which our social relations are entangled. This book, based on almost two hundred interviews and two years of fieldwork in every province and territory of Canada, uncovers the day-to-day stories of off-gridders, illustrating why and how someone lives off-grid. Written in the style of a travelogue and intended for both the general public and students and scholars, the book is published by Routledge as part of its Innovative Ethnographies series, and can be purchased on the publisher’s website or through many other online retailers such as Amazon.com or Amazon.ca. The content displayed in the pages of this website was produced to accompany the book, which is published in both paper and electronic versions.